The ESA-JAXA BepiColombo joint mission to Mercury has been launched on an Ariane 5 from Europe’s Spaceport in Kourou at 01:45:28 GMT on 20 October on its mission. Signals from the spacecraft, received at ESA’s control centre in Darmstadt, Germany, via the New Norcia ground tracking station at 02:21 GMT confirmed that the launch was successful, according to ESA’s press release. It is the first European mission to Mercury, the smallest and least explored planet in the inner Solar System, and the first to send two spacecraft to make complementary measurements of the planet and its dynamic environment at the same time. It will enable a better understanding of the planet’s history, geology, composition, atmosphere and magnetosphere. 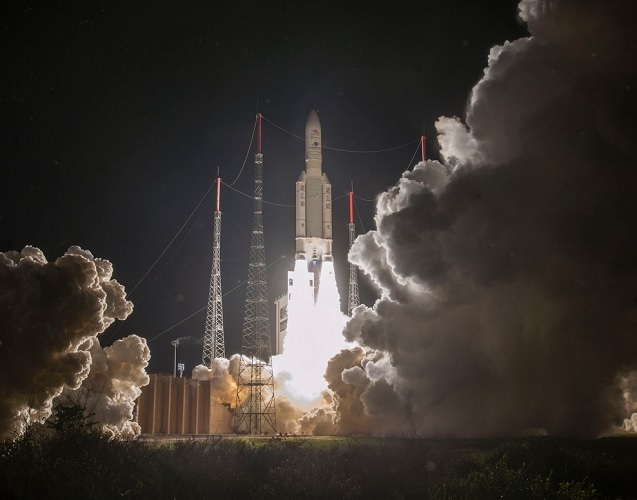 The fifth Ariane 5 launch of the year placed BepiColombo into an Earth escape orbit. Arrival at Mercury is planned for late 2025, following a space journey lasting seven years and covering nearly nine billion kilometers. Once the spacecraft reaches its destination, the BepiColombo mission will last for one year, with the possibility of extending its measurements for another year. BepiColombo comprises two science orbiters: ESA’s Mercury Planetary Orbiter (MPO) and JAXA’s Mercury Magnetospheric Orbiter (MMO, or ‘Mio’). The ESA-built Mercury Transfer Module (MTM) will carry the orbiters to Mercury using a combination of solar electric propulsion and gravity assist flybys, with one flyby of Earth, two at Venus, and six at Mercury, before entering orbit at Mercury in late 2025. The two science orbiters will also be able to operate some of their instruments during the cruise phase, affording unique opportunities to collect scientifically valuable data at Venus. Moreover, some of the instruments designed to study Mercury in a particular way can be used in a completely different way at Venus, which has a thick atmosphere compared with Mercury’s exposed surface. Deployment Solar Panels. Image courtesy of ArianeGroup. Other challenges include the extreme temperature environment the spacecraft will endure, which will range from -180ºC to over 450ºC. Many of the spacecraft mechanisms and outer coatings had not previously been tested in such conditions. The overall design of the three spacecraft modules also reflects the intense conditions they will face. The large solar arrays of the transfer module have to be tilted at the right angle to avoid radiation damage, while still providing enough energy to the spacecraft. On the MPO, the wide radiator means the spacecraft can efficiently remove heat from its subsystems, as well as reflect heat and fly over the planet at lower altitudes than ever achieved before. Eight-sided Mio will spin 15 times a minute to evenly distribute the Sun’s heat over its solar panels to avoid overheating. The BepiColombo team has covered every external surface of ESA’s MPO, except for the single radiator side, with high-temperature, multi-layered insulation. The material, made up of 50 layers of ceramics and aluminium, was especially designed for the BepiColombo mission. The antennas are made of heat-resistant titanium, covered by a newly developed coating. 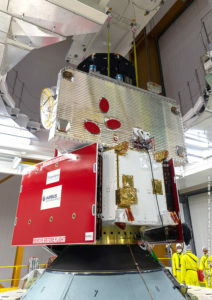 BepiColombo positioned atop Ariane 5’s core cryogenic stage. Flight VA245.. Image courtesy of ArianeGroup. As the MPO’s mission is to investigate Mercury’s surface, one side will always be facing the planet, so that the instruments can monitor the surface at all times, while the radiator faces away from the planet into deep space to dissipate heat. A few months before arriving at Mercury, the transfer module will be jettisoned, leaving the two science orbiters – still connected to each other – to be captured by Mercury’s gravity. Their altitude will be adjusted using MPO’s thrusters until MMO’s desired elliptical polar orbit is reached. Then MPO will separate and descend to its own orbit using its thrusters. Together the orbiters will make measurements that will reveal the internal structure of the planet, the nature of the surface and the evolution of geological features – including ice in the planet’s shadowed craters – and the interaction between the planet and the solar wind. BepiColombo in Space. Image courtesy of Airbus.